Cool! Just today I saw some cool stuff for the iPod and iPhone. There’s a new solar panel that can power the charger, sound dock, and even an LED desk lamp. The solar panel set up was made by ReNu and will run you around $200. The company claims that if you leave your solar panel in the sunlight for around 15-20 (a full day’s worth of sun more or less) you’ll have enough power to get 9 hours of music from your iPod. A good set up would be to have your ReNu solar panel by your window so that it continually get sunlight throughout the day. Now this product won’t actually be hitting the market until next year but it’s something to keep in mind. 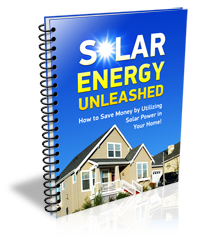 If you don’t feel like waiting for the next big solar product to come out your could always just build your own solar panel and charge all of your i-products as well as many other house hold items. Basically you’d first need some solar cells which you could buy off of Ebay. Then you’ll need a panel and some wiring to connect all of the solar cells together. Get yourself a storage battery for all of that sun power and then power up whatever home appliances you want. If you need more power simply add more panels and more batteries.